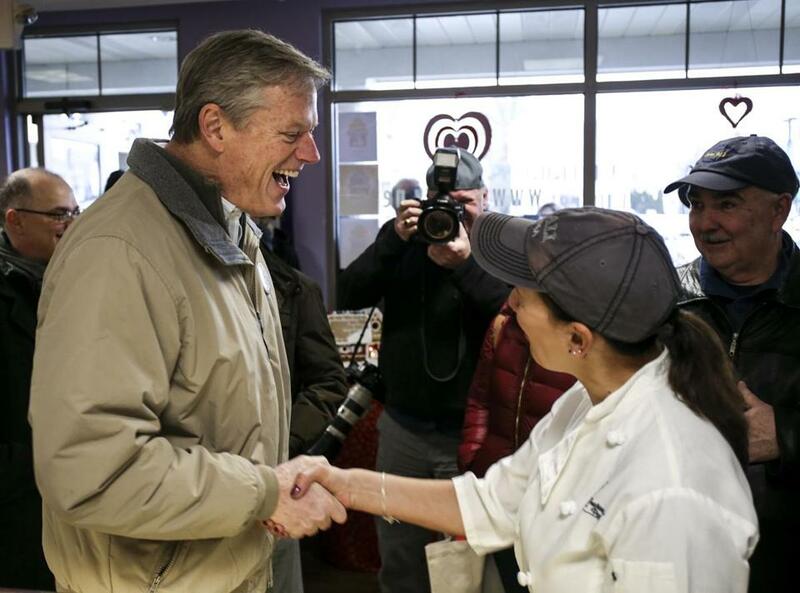 Governor Charlie Baker met with Sue Robert, the owner of Frederick&apos;s Pastries in North Andover, during Saturday’s tour of the Merrimack Valley. NORTH ANDOVER — Chama Grill in downtown North Andover entered 2019 having missed out on the Christmas-party business that boosts the restaurant at the end of the year. Even though the spot serving all-you-can-eat Brazilian barbecue was open in December, many customers booked their holiday gatherings elsewhere back in September and October when the restaurant closed for five weeks because of the gas fires and explosions in the Merrimack Valley. “The worst part of it is we lost our Christmas business. We couldn’t book any parties,” said owner Shahram Naghibi, who also had about a half-dozen workers resign while the restaurant was closed. On Saturday afternoon, Governor Charlie Baker tried to help Naghibi with his predicament, stopping into Chama Grill with Lieutenant Governor Karyn Polito and other staff members to generate publicity for the business. The visit was part of an afternoon tour by the Baker administration of restaurants and stores affected by the Sept. 13 gas disaster and marked the culmination of inaugural activities for the governor, who was sworn in for a second four-year term Thursday. 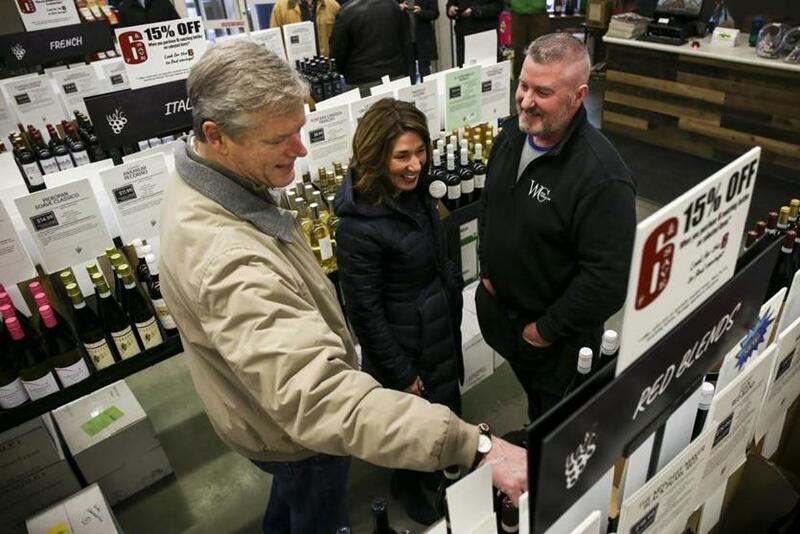 Baker (left) and Lieutenant Govenror Karyn Polito (center) browsed wine at the Wine ConneXtion in North Andover. Thousands of people were left without heat or hot water after an overpressurization of the gas delivery system sparked more than 120 fires and explosions in North Andover, Andover, and Lawrence, killing a teenager and injuring more than 20 people. A massive recovery effort followed, during which more than 43 miles of underground pipeline were replaced, and more than 5,000 new service lines and 18,000 pieces of equipment and appliances were installed, officials have said. About 20,000 damaged appliances were removed. The work to restore heat and hot water was “substantially completed” on Dec. 12. All but three businesses affected by the disaster have reopened, local officials said. Columbia Gas, the utility responsible for the disaster, has paid nearly $21 million in business claims, a spokesman said Saturday. A preliminary investigation found that an engineer erred in planning for a construction project to replace underground pipelines in South Lawrence by failing to relocate a critical pressure sensor. When the errant sensor failed to detect pressure, the system was overwhelmed with high-pressure gas, triggering the fires and explosions. Last Monday, Baker signed a bill into law that requires a certified professional engineer review projects involving pressurized gas lines. The federal investigation into the disaster, however, is on hold because of the government shutdown. Baker was upbeat during the tour, buying Girl Scout cookies from a Brownie troop in Andover and sipping a margarita at the bar at Casa Blanca, a Mexican restaurant in Andover that was closed for nine weeks. In Lawrence, Joe Chui, owner of Golden House Restaurant, embraced the governor as he entered the dining room. “Thank you, Charlie,” said Chui, who set out trays of crab rangoon, chicken fingers, and scallion pancakes for the governor and his entourage. 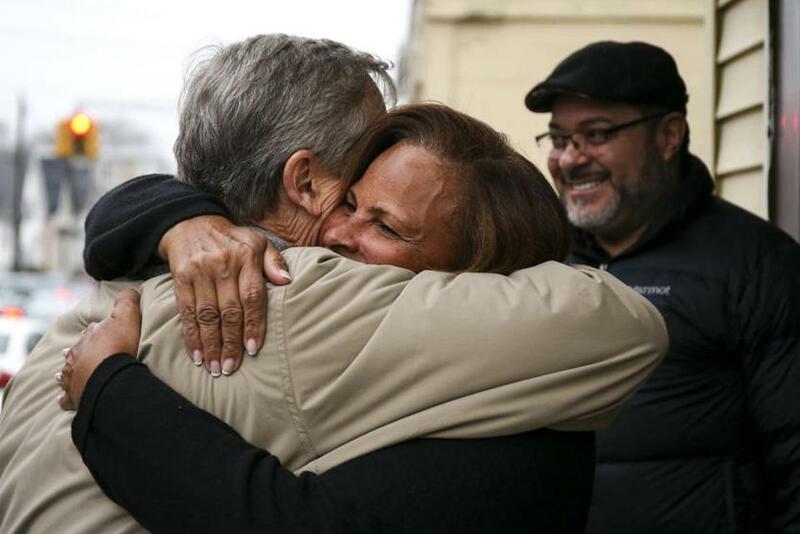 Alex Mercedes, whose family runs Jacqueline’s, a Lawrence grocery store, said in the wake of the disaster his uncle drove to New York and purchased electric-powered appliances so the bodega could reopen quickly and preserve jobs for their workers. Baker embraced Rosaura Keleher, a school bus driver, outside of Janet Beauty Salon in Lawrence. Local officials in the three communities have tried different initiatives to bring customers back to businesses affected by the gas fires using $10 million that Columbia Gas set aside in November. In North Andover, gift card promotions generated about $300,000cq for local businesses, Town Manager Andrew Maylor said. Andover conducted three events over the holidays to try to lure shoppers downtown, said Andrew Flanagan, its town manager. At one event, shoppers who spent at least $50cq were entered into a raffle for gift cards of $500cq, $1,000cq, and $2,500cq, he said. The promotion generated about $150,000cq, Flanagan said. He said he is forming a committee to consider how to spend Andover’s $2 million portion of the money Columbia Gas set aside to promote local businesses. Some businesses said they’re still waiting for Columbia Gas to reimburse them for lost revenue related to the disaster. Sue Robert, who owns Frederick’s Pastries in North Andover, said the bakery uses electrical appliances and was only closed for a few days, but business tanked in the next weeks. She estimated she lost about $10,000 in sales and filed a claim with Columbia Gas, but expects her request won’t be processed until residential customers are made whole.